The SmartWool NTS Micro 150 crew long-sleeved shirt is a 100% Merino wool base layer. Wool is naturally a good fiber for heating, cooling, moisture management and odor-resistance. 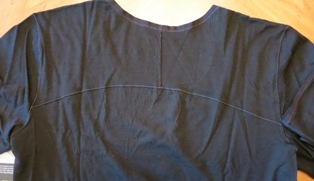 'NTS' stands for next-to-skin indicating it as a base layer. 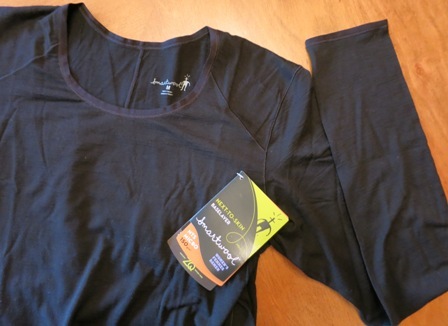 Micro 150 is their lightest base layer. The jersey knit is princess cut in a feminine way for a form-fitting design. The side seams wrap around to the front to achieve this form-fit. The shoulders have a combination of a raglan (think softball shirt sleeve) in the front and saddle with a yoke in the back. The bottom-line is that there is no seam at the top of the shoulder which helps with comfort especially while carrying a pack. The fabric has a stretch to it for better fit and comfort. 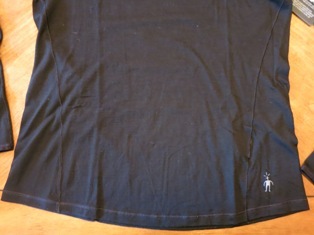 At the lower hem there is a Smartwool logo. All of this sounds fine although I have no plans to iron or dry clean a baselayer top. My initial impression was that the shirt seems soft and lightweight while not being completely see-through. Given its lightweight baselayer style, I was expecting something practically see-through but this top seems fine for wearing as a single layer as well as a base layer. I tried it on and was very pleased with the fit. The princess seams make for a nice womanly fit. The sleeves are slightly long which I immediately like also. When I pull them to their full length, they extend to my first knuckles on my hand. The crew neck is just right; high enough to provide good coverage without being too high on my neck. The hem is slightly long also which will help for tucking it in and for holding it down over my hips during use. I noticed that the fabric tended to attract lint which is noticeable in my photos despite my trying to brush it off. I'll have to see if that is an issue while wearing and laundering the shirt. I'm excited to try this shirt out as a baselayer for snowshoeing since the weather has turned cold. 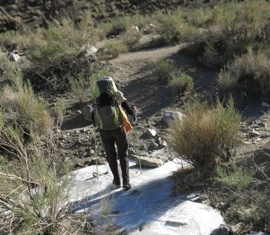 But I'm also planning some desert hikes this winter and wondering how well it will work as a primary layer. The SmartWool NTS Micro 150 crew long-sleeved shirt is a lightweight baselayer that can also be worn as a single layer. Does the fabric attract too much lint? Over the test period I wore the SmartWool shirt for one four-day backpacking trip, five day hikes, five snowshoe hikes and four pre-dawn runs. I almost always wore a jacket or other layers over the shirt due to the colder weather. Marble/Cottonwood Canyons, Death Valley National Park, California: 4 days, 21 mi (34 km); 2,120 to 3,500 ft (646 to 1,067 m) elevation; 15 to 45 F (-10 to 7 C). Clear with breezy conditions. Overgrown unmarked trail conditions with mostly sand and rocks. El Paso Mountains, California: 2,850 ft (869 m) elevation; 14 to 41 F (-10 to 5 C); sunny and clear. Sierra-at-Tahoe, Sierra Nevada, California: 3 mi (4.8 km); 7,200 to 7,370 ft (2,195 to 2,246 m); 30 to 34 F (-1 to 1 C) with overcast gray skies. Ellicott Trail, Sierra Nevada, California: 3 mi (4.8 km); 4,700 to 5,000 ft (1,433 to 1,524 m); 32 to 36 F (0 to 2 C) with light snow and gray skies. Van Vleck Trail, Sierra Nevada, California: 5.0 mi (8.0 km); 6,327 to 6,500 (1,928 to 1,981 m); 28 to 30 F (-2 to -1 C) with partly sunny to stormy skies. Donner Rim Trail, Sierra Nevada, California: 3.5 mi (5.6 km); 6,414 to 7,111 ft (1,955 to 2,167 m); 30 F (-1 C) with light snow all day. China Wall OHV Area, Sierra Nevada, California: 4.0 mi (6.4 km); 4,900 to 5,100 ft (1,494 to 1,554 m); 30 to 34 F (-1 to 1 C) with light to heavy snow all day. The shirt has performed flawlessly over the test period. In my drawer it appears like any old base layer since I have several of the same color. But when I put this shirt on, I'm always pleasantly surprised at how comfortable it is, how well it fits and just how much I like it. I really love the longer sleeves and hem which provide extra protection. The sleeves keep my wrists covered even when a gap appears between my jacket and gloves while snowshoeing. And the longer hem helps to keep the shirt down over my hips during strenuous activity and while sleeping. I typically wore the shirt with a fitted jacket atop for running and hiking. For snowshoeing I added a rain jacket also. There were a few times when I was able to wear the shirt alone as a sole layer. On one morning run of 48 F (9 C), I ended up taking off my jacket and wearing the shirt alone. On the first day of the backpacking trip I was able to shed layers during the warmest part of the day and wear the shirt alone for a short time. Due to the colder temperatures during this period I wasn't able to get much testing in with the shirt as a sole layer but will likely see more of that in the Long-Term test period. I have machine-washed the shirt six times so far always on cold and laid it flat to dry. I found that since I always wanted to wear the shirt that it didn't get washed as often as it needed. On one trip I wore it for six days before I was able to get home and wash it. The odor got foul atter several days of wear but was remarkably odor-resistant given the amount of use. I like the fit of the collar since it doesn't come up high enough to restrict or bother my neck but it still provides full coverage for cold activities. Initially I was concerned whether the shirt would collect lint as many black items of clothing tend to do. However, I didn't find it to be a particular issue with this shirt. 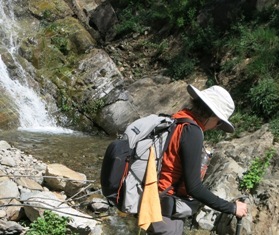 Over the test period I wore the SmartWool shirt for one three-day backpacking trip, two overnight backpacking trips, a car camping trip, two snowshoe hikes and three pre-dawn runs. I wore the shirt alone at times while running and backpacking. I also wore it for sleeping on the overnight trips. For snowshoeing I wore it primarily with other layers. 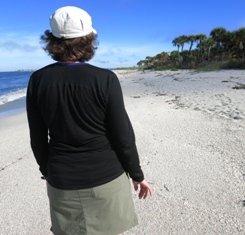 Cayo Costa Island, Florida: 3 days, 13.4 mi (21.6 km); nearly sea level; 58 to 74 F (14 to 23 C). Partly cloudy with one huge thunderstorm. Usually light breezes with some high winds during the storm. Hunters Trail, Sierra Nevada, California: 2 days; 15 mi (24 km); 3,500 to 4,500 ft (1,070 to 1,370 m); 48 to 70 F (9 to 21 C); clear and sunny on trail through burned forest. 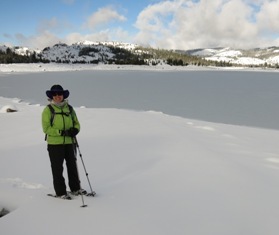 Loon Lake, Sierra Nevada, California: 2 days; 8 mi (13 km); 6,327 to 6,478 (1,928 to 1,974 m); 30 to 50 F (-1 to 10 C) with mostly sunny spring conditions turning to dark stormy conditions on the hike out. 6 to 8 ft (1.8 to 2.4 m) of snow depth. Manatee Springs, Florida: 2 days; 32 ft (10 m) elevation; 50 to 65 F (10 to 18 C); mostly clear with some windy conditions. Van Vleck Trail, Sierra Nevada, California: 3.5 mi (5.6 km); 6,327 to 6,478 (1,928 to 1,974 m); 35 to 45 F (2 to 7 C) with full sun and a light breeze. Snow depth base was 4 ft (1.2 m). Mount Rose, Carson Range, Nevada: 8,900 to 9,300 ft (2,713 to 2,835 m) elevation; 36 to 39 F (2 to 4 C); cloudy conditions with brisk wind. Snow depth base was 6 to 10 ft (1.8 to 3 m). Pre-dawn runs were from 2.3 to 3.6 mi (3.7 to 5.8 km); 39 to 50 F (4 to 10 C); dry conditions; occasional breezes. I continue to love the comfort that this shirt provides. The longer sleeves and longer hem function very well in outdoor activities. While snowshoeing my wrists don't seem to get that cold gap since the sleeves stay put. The longer hem keeps the shirt in place despite my rolling around at night. I tuck the shirt in sometimes but it doesn't seem to be necessary since the shirt tends to stay down over my hips. I typically wore the shirt with a fitted jacket atop with a few opportunities to wear it alone. I'm mixed about my feeling on wearing it as a sole layer since it is quite thin. I find myself to be comfortable with wearing it with a black sports bra underneath. In warmer weather the black color just doesn't work for wearing it as a sole layer, so I'll probably just keep it as a wonderful base for my layering system. I like that the NTS shirt really is 'next-to-skin' meaning that it doesn't add weight or bulk to my layering system but certainly does provide a comfortable amount of warmth. It also functions well as a single-layer sleep shirt while backpacking. I have machine-washed the shirt another six times for a total of twelve times always in cold water with liquid lavender laundry detergent and laid it flat to dry. I continued to wear it more than once between washings just due to trips and wash day schedules. The shirt didn't seem to have any foul odor with just two days between washings. The durability of the shirt has been great. It still looks like-new and has no signs of wear, misshapenness, or other degradation. The seams are intact and even the SmartWool logo is holding up well. The SmartWool NTS Micro 150 crew long-sleeved shirt is a lightweight baselayer that provides a warm but non-bulky base to a layering system. This concludes my Long-Term Test Report and this test series. Thanks to SmartWool and BackpackGearTest.org for allowing me to participate in this test.